Being a part of the Soil Health Partnership was a natural decision for two Iowa farmers who have now been enrolled in the program for a number of years. “I wanted to learn more about my soils and we were just getting into cover crops, so it just fit very well into what I was already doing,” said northeastern Iowa farmer Don Elsbernd, who has been part of the program for five years. Third year participant Kevin Ross from Underwood, near Council Bluffs, said he wanted to learn about cover crops as well as forage use. 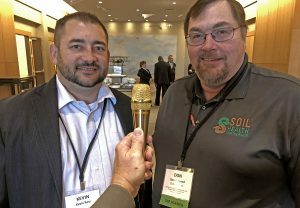 Elsbernd and Ross were both at the 2018 Soil Health Summit, and agreed it was a worthwhile event. “If you like the project, even if you’re not enrolling in it, the Summit is something you can come to every year and learn about the data of the new enrollees and the past ones and where that stuff is going, so there’s something for everyone in the Partnership,” said Ross. The opportunity to enroll in the program has been extended and there is availability for more farmers to join. Visit www.soilhealthpartnership.org for more information.